There's an old adage that photography is akin to 'painting with light', and that cinematography is the moving equivalent. Controlling light is vital to achieving a professional 'look' with video, whether you're shepherding natural and 'found' light, or setting up a vast array of bulbs. This article aims to help you start achieving that control. Since we all want to get 'hands on' as soon as we can, I've covered basic techniques first. After this you'll find a description of some of the types of lights and lighting accessories available, as well as their practical benefits and drawbacks. Lighting has three key roles in video: to help you to achieve correct exposure in your camera; to heighten mood; and to enhance the sense of three‑dimensional space in the two‑dimensional image (even with stereoscopic 3D shooting). 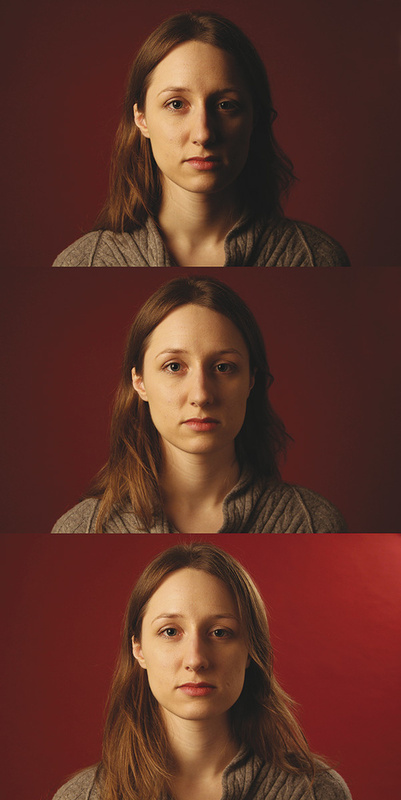 These three images show three‑point lighting being built up. The top shot shows the key light, while in the middle one the 'fill' has been added. The third adds a rim‑light, separating the subject from the background.The three‑point technique involves using three light sources to create a sense of depth and a balanced exposure. If you're in a studio environment, start from darkness and build up your scene. 2. The fill is used to lighten some of the shadows on the opposite side of the face to the key, and can be another light source or a reflector throwing some of the key light onto the subject. In general, the fill light will be weaker than the key, and using too much fill will 'flatten' the subject, removing depth. 3. The third light is the back light, rim light or 'kicker', and serves to lift the subject off of the background by creating a subtle glowing edge around them. This light is easily overdone: the intention is just to add a little more depth to the scene. If you find (as is likely) that bare bulbs make your lighting too harsh, you can use a 'softbox' around the light, or a 'scrim' in front of it. A scrim can just be a simple piece of fabric, or other material that will diffuse the light, while a softbox is generally a four‑sided pyramid lined with silver material and capped with a scrim. Softboxes have the advantage of stopping light from spilling across your set, but are a little more fiddly to work with. Barn doors — metal flaps that can be angled to direct the light source — can also hold filters. Once you've experimented with three‑point lighting, start breaking the rules! Remove the fill for a dramatic look, light from below to create a sense of foreboding, even try flat lighting and compare it to a more three‑dimensional style. Try out 'high key' lighting, where the scene is very strongly lit by the key and fill, or attempt 'low key' lighting, where only a key and minimal fill are used, for added drama. It won't be long before you're confident about positioning your lights and pulling your subjects out of the darkness. The light in this shot is provided by a single, small window. The internal glass walls were allowing too much light to hit the near side of the subject's face, reducing the drama of the scene, so we covered the entire wall in black sugar-paper!Many scenes take place outdoors, or indoors near windows, and in such situations you'll want to make use of natural light. Sometimes lighting can be as simple as placing the subject and camera to create a natural sense of depth. Once again, a reflector can be really useful. Fighting the sun is a task for a madman, so working with it is your best bet outdoors. Take advantage of natural and architectural shade, and rig up sheets and other such items to guide the sunlight. Compared to setting up and powering large arrays of lamps, sheets of reflective or dark material can be cheap and surprisingly convenient. To use natural light indoors, start by finding a window as a key light for your subject, and use a purpose-made reflector or something improvised, like a white sheet, as a subtle fill. You can add artificial light to a scene that's lit with daylight, but you'll have to think about colour temperature (see the 'Colour Temperature' box). If you don't have a stand for a reflector (or even your lights), get a friend to help. The affectionate term for holding a reflector, or otherwise performing the function of a stand, is to 'Hollywood'. Adds a little glamour to the role, don't you think? So what do you do if you have nothing but yourself, your camera and an actor? Some of my favourite shots have been lit using just a window, and enhanced using grading software. The example above is lit by a single window, while the room is surrounded by glass dividing walls that were letting in a lot of light. I had scouted the location ahead of time, and rather than adding more artificial light to create the effect I wanted, I headed to a local art supply shop to buy 30 sheets of black sugar‑paper and some Blu-Tack. After about two hours of blacking out the whole glass wall behind the camera, we had our scene! 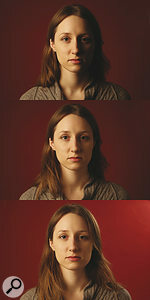 Lighting can also be used in unorthodox ways to bring different emotions or points of interest to a scene. Certain types of video camera are great in low‑light situations, meaning that even a candle can be useful as lighting. Video-capable still cameras and DSLRs, often equipped with large sensors and fast‑aperture lenses, are a good example of this. If you're shooting with a shallow depth of field (in‑focus subject, out‑of‑focus background), you can create depth with 'point' light sources — such as fairy lights or a desk lamp — in the background. Though the lights are likely to over-expose, the fact that they're out of focus will make them look quite soft and pleasing to the eye. As an interesting side note, digital cameras still don't really capture the same level of detail as some 35mm film stocks when it comes to handling highlights. Check out Zacuto's Emmy-winning 'Great Camera Shootout' at www.zacuto.com/shootout for examples of the differences. Just as one type of mic might not be right for every vocalist, or one type of lens for every shot, you're unlikely to find one light that's perfect for every scene, so knowing the types available can help you in planning ahead and thinking on your feet. Whatever type you're using, stay safe on location or in the studio. Keep cables safely taped down, and call out 'striking' or something similar when turning on a light, so that you don't hurt anyone's eyes by accident. Since lighting a scene can be an expensive business, I've arranged the types of lighting in terms of relative cost, from least to most expensive. As with every creative discipline, you can buy budget and luxury versions of each type (and could write a book about them all too), but this should be enough information to get started with. Reflectors are great for controlling sunlight. Here, a gold surface is being used to light the model, for a flattering, warm look.Since sunlight is (for now at least) free, as is any lighting already present at your location, a simple reflector can be your best friend. A reflector is usually a disc of around a metre in diameter, which folds neatly into a much smaller zip case. Its surfaces will be white, translucent, silver, gold or black, with each colour affecting how light is transferred (or otherwise) onto the subject. Some cunning reflectors have a zip around the edge, so you can use one of all five colours in a single reflector. Pretty handy! Aluminium foil and black aluminium foil (or 'black wrap') is very useful for controlling both artificial and natural light too. You can pick up a basic reflector for as little as £15$20. Exposure refers to how light or dark a whole scene is when viewed by the camera. An evenly-lit scene with very few dark or bright points is described as having a low 'dynamic range', while one with plenty of deep shadow and strong highlight has a high 'dynamic range'. Imagine a scene with a very bright light in it. Cameras can only capture a limited amount of dynamic range, so if you don't want to 'clip' (over-expose) a bright area into pure white, the likelihood is that you'll need to reduce exposure. This will make the rest of the scene appear darker, perhaps clipping into pure black. Sometimes this dramatic look is desirable, but if not, adding more light to the rest of a scene will allow you to achieve a more even exposure. Mood: The mood of a scene can be dramatically affected by the way shadow falls across individual faces or objects. A hard shadow on one side of the face can create a sense of intensity, while soft and even lighting can make a subject appear somewhat neutral, or even angelic. Green tones can make things seem forbidding (especially if a scene is dark), while blue is thought of as 'cold'. 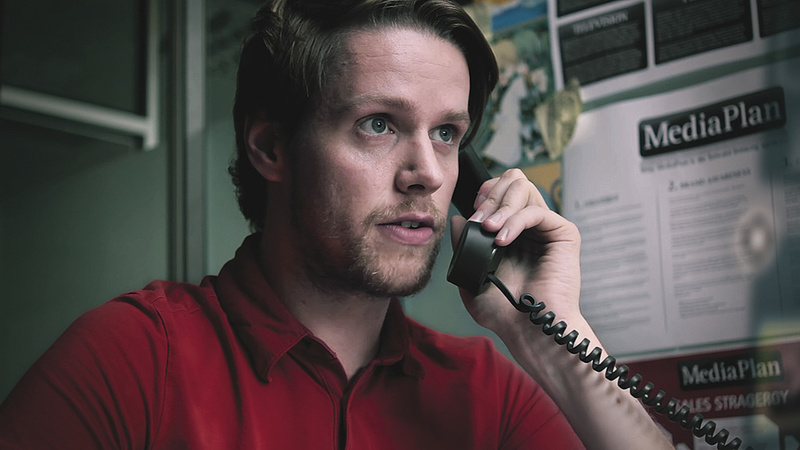 Red is 'warm' and often used to flatter an actor or make a scene feel comfortable. Most film‑makers will use digital colour‑correction and grading to achieve the final 'look' of their piece, but using coloured lights can be just as effective a method of enhancing mood as matching all lights to a single colour and leaving major colour‑shifting to post production. Depth: In order to create a sense of depth within a scene, lights can be used to enhance the contrast between the foreground and background, as well as picking out the shape of subjects. If, for example, an interviewee is wearing black and is sitting in front of a black background, how do we stop them from appearing as a floating head? The most common method of lighting such a scene is known as 'three‑point lighting', and using it can help you to get a grasp of the many possible uses of lighting in video. The Rotolight Interview Kit is a great example of modern LED lighting, with daylight-balanced LEDs running from three AA batteries, mounts for camera and tripod, and storage for custom gel. It's not all that controllable, but sometimes domestic lighting can save your bacon. I recently had a scene that was supposed to be lit by a single window. It was during British winter time, and because a shoot in another location ran over, we lost the light. We had two LED lights (Rotolight RL48s) for the actor, but nothing to light the background with. Placing an anglepoise lamp just off screen to the right threw plenty of light across the back wall, and after gelling the Rotolights to match the warm colour temperature of the lamp, we had our scene. Old fashioned, non-energy‑saving bulbs will have 'temperatures' of 2600K or so, which can be problematically low, but much modern lighting has a higher natural temperature. If you're going to run with domestic or found electrical lighting, be prepared to 'gel' (see 'Gels For Colour & Brightness Control' box) and improvise a little to get the best results. Sometimes a £20$30 desk light can come to the rescue! Pros: Easily available and cheap. Cons: Unreliable quality and brightness of light, varied colour temperatures. 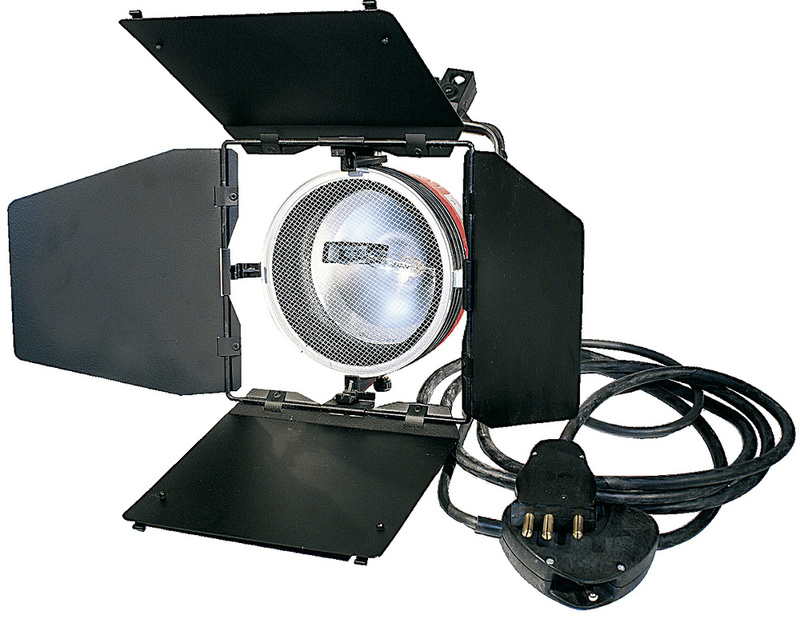 This tungsten 'redhead' light is equipped with 'barn doors' for controlling the light beam. Fresnel lights also have a focusing lens over the lamp.It's only recently that LEDs (Light Emitting Diodes) have become acceptable for video lighting, due to falling cost, and improving colour temperatures and quality of light, but they're storming up the popularity charts. On the face of it, LEDs look to be perfect for the task: they require barely any power, are bright, run cold and (this being much more important than it sounds) weigh very little. A budget panel with 600 LEDs might cost something like £250$300 — not very much for the amount of light such a panel kicks out. Tiny panels are available for on‑camera use from as little as £30, so you needn't be without any light at all, no matter what your budget. 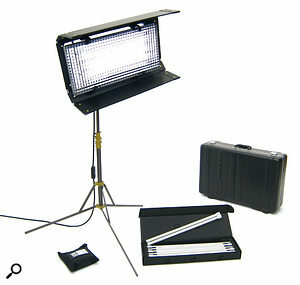 However, specialist spot LED panels like the Litepanels SuperSpot can cost as much as £2100$1800. Cheaper models tend to suffer from a green 'spike', as well as the usual build‑quality issues associated with budget gear. The green spike is a subtle green hue to the illumination, corrected by using a magenta or rose-coloured filter gel. This trait can make some LED lights struggle to blend with other light sources, though higher‑end models tend to eliminate these issues. Since a single LED doesn't 'throw' light too far, a bright LED panel must be made of many rows of LEDs. This means the light is coming from a broad source, and using such a light as a spotlight is difficult unless you use a specific kind of panel with angled LEDs. Using barn doors with large LED panels can result in a 'stepped' edge to your lighting, which is quite unattractive. Large LED panels are relatively soft lights, and are a good alternative to high‑end fluorescents if you can't afford to buy them, or don't want to hire and transport such large and intimidating lighting fixtures! The Kin Flo Diva 400 kit is a relatively high‑end fluorescent lighting solution, providing soft, controllable light with no visible flickering. Pros: Low power consumption, cold operation, available at low cost. Cons: Some have green tint, and they lack the 'punch' of tungsten or HMI. Still the most common form of on‑set lighting in budget productions, tungsten lights run very warm in both colour and physical temperature! Tungsten bulbs are used in cheap worklights as well as purpose‑built video lights such as 'redheads'. (A redhead is a bright tungsten lamp of between 500W and 1000W, while a 'blonde' is one of around 1000W to 2000W. Many tungsten lights come with a 'fresnel' element at the front. Pronounced 'fray‑nell' if you're sticking with the word's French origins, or with a silent 'S' if you prefer, this refers to a glass element at the front of the light that can be focused, allowing it to be used either as a spotlight or a floodlight. Tungsten lights have a colour temperature of around 3200K (though this can vary a little with voltage and the like), so they'll be much redder than most daylight. This means that gelling them with CTB (Colour Temperature Blue) gel is necessary for mixing them with daylight. Bear in mind that such gelling reduces the brightness quite a lot too, though. You can get fixtures with dimmers, but be aware that dimming a tungsten bulb significantly reduces the colour temperature, making Neutral Density gels a better solution for dimming. It's quite possible to give yourself a nasty burn from a tungsten light, since they run extremely hot, so do be careful and make sure that everyone else on‑set is aware of the danger. Such lights are also very inefficient when it comes to power consumption, so be sure to check how many you have plugged in at once. Halogen-based 500W worklights are great for video beginners, giving a lot of direct light for about £15$20 each, while a solid redhead like the Arri 800W costs around £300$400. Pros: Bright and strong illumination, and relatively inexpensive. Cons: Cumbersome, inefficient, run hot, low colour temperature. 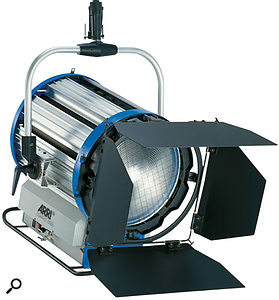 This Arri 12,000W HMI Fresnel light is daylight balanced (5600K) and outputs extremely bright and powerful illumination, but doesn't come cheap, at around £11,000$14000!We've all seen fluorescent bulbs, which are perhaps most commonly associated with office lighting. Specialist fluorescent lighting is useful in professional video production too, and can bring a wonderful, indirect glow to scenes. Fluorescent lights intended for production have some special customisations, including daylight or tungsten balanced tubes, dimming and flicker‑free operation. Fluorescents use electronic 'ballast', which controls the power supply for the light, raising the frequency of the flicker beyond that which would show up when recorded to video. Some fixtures have a ballast built into the light fitting, while larger lights will have an external ballast box that can be situated further away from sensitive equipment. Although small, two‑tube fluorescents can be cheaper for the same brightness than LED lights, the fact that they aren't available in such tiny and inexpensive form‑factors as LEDs puts them later in this list. Pros: Great for soft, natural lighting. Cons: Cumbersome, can be fragile. VM_Light_Fantastic_07HMI lighting is top of the pile for video work, if you can afford it. You'll find it on movie sets, TV shoots and being used in music videos on a budget. The initials 'HMI' save you from having to say 'Hydrargyrum medium‑arc iodide', which is no fun after a few drinks at a wrap party! HMI lights provide a strength of light greater than tungsten‑based lights, but run both cooler and much more efficiently. An HMI light is around three to four times brighter than a tungsten lamp of equivalent wattage. HMI lighting is a little more heavy‑duty than a redhead or an LED panel and, like professional fluorescent lighting, uses an electronic 'ballast' to strike it up, regulate power and eliminate flicker. Older models used a magnetic ballast, which could have problems with flicker at certain camera shutter speeds, but modern electronic ballasts should eliminate such issues. HMIs are dimmable by about 50 percent with only a small change in colour temperature of about 200K. You can buy small HMI on‑camera lights, often known as 'sun guns', but HMI lighting is usually found in place of tungsten lighting, and is daylight‑balanced, powerful and 'punchy'. After all that praise, you'll be waiting for a down side, and there are a couple. Firstly, HMIs are very expensive. Despite their efficiency and usefulness, HMI lighting of equivalent brightness to an 800W redhead will cost you upwards of £2000$3000, while the price of an on-camera sun gun averages around £800$1100. They are also extremely high‑maintenance tools, with expensive bulbs of limited life (old bulbs are both lower in colour temperature and can be dangerous), heavy ballast and fixtures, and generally more heavy‑duty rigging. Safety issues include bulbs becoming rather volatile towards the end of their life, high voltage when switching on a lamp, and high UV output, which makes removing the filter in front of the bulb dangerous, with potential for skin burns and eye damage from prolonged exposure to the light source. The lights can also hum, and the ballasts can be noisy, often including cooling fans. Hiring HMI lights is an option for production, as long as you take into account transport costs and the elevated complexity of their operation. Pros: Daylight balanced, efficient, bright. Cons: Heavy, inconvenient and extremely expensive. Like many such creative disciplines, lighting a scene can be as expensive and difficult or as cheap and easy as you make it. Even with just a window and a bit of ingenuity you can create a successful scene with a sense of depth. You'll discover areas of great difficulty when fighting nature, rather than working with it. If you have bright sunlight, don't try and light against it, or you'll find yourself heading to the hire shop for some 18,000W HMIs and a generator. Instead, work to control what's available to your taste and you'll have a much easier time in both production and post production. Gels, reflectors, black wrap and other such simple tools are some of the most powerful in your kit, along with your ability to improvise and think in terms of the final picture. Practice makes perfect, so get some basics together and start shooting! While the human visual system is very good at adjusting to changes in colour and brightness, cameras see things a little differently. We all know that sunset and sunrise, for example, are redder than midday, but for a camera, such tones are quite exaggerated. 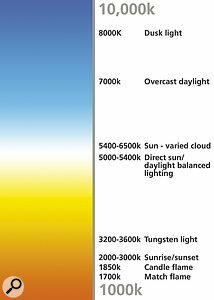 The chart to the right gives you a rough guide to the colour temperature of some kinds of daylight and artificial light. Setting your camera's white balance to one of these settings will let it see that particular temperature as white, helping you to balance your scene. Mixing lights of different temperatures in a single scene can be problematic unless you're using mixed lighting for a specific purpose, so gels can be used to match lighting temperatures (see box elsewhere in this article). If you keep the temperature or all of your lights the same and make your camera see the scene as daylight, you'll be able to adjust the colour of the scene easily in post production. The measurement itself is based on a thermal temperature system known as 'Kelvin'. 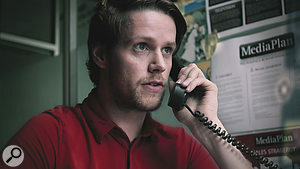 A 'black body radiator' (a piece of black metal, for example) theoretically gives off these colour tones when heated to the corresponding temperature, though this scale is used as more of a theoretical model in video production. As bizarre as that explanation sounds, this is a standard across video and still photography, so it's good to know the details of it. If you want to change the colour and tone of light, you'll want to use gels. Gels are pieces of coloured plastic or glass, specially designed to restrict or entirely block the passage of selected frequencies of light. Some gels are purpose‑made for particular lights, and come with the package. 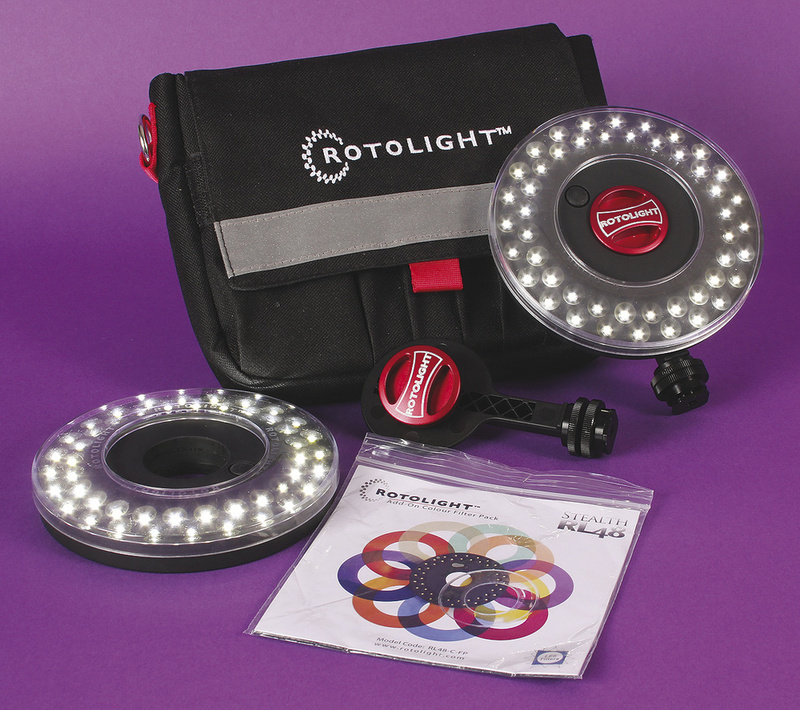 Many LED lights will include a magenta or rose‑coloured gel to correct the green tint the lights can give off. 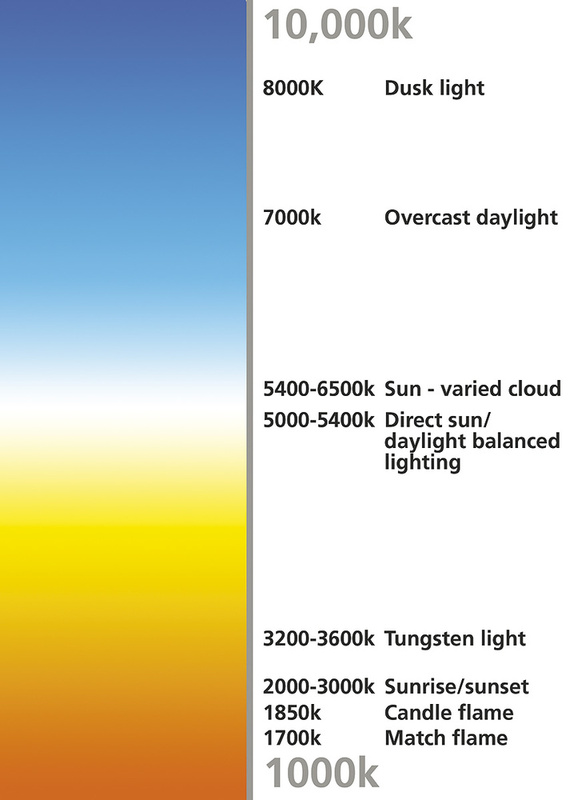 Lights that are balanced for daylight (5600k or so) will often include a CTO gel (Colour Temperature Orange) for balancing them wih 3200k tungsten lights, while CTB (Color Temperature Blue) gels can be used to make the warmer tungsten lights match with average daylight. Since there are colours in between these temperatures, gels such as quarter‑ and half-CTB or CTO are probably more useful, as they can be 'stacked' to achieve in-between temperatures. Don't forget that you can gel a window too, if you have a big enough sheet! One often‑overlooked use of gels, especially among beginners, is dimming lights. Lights using energy‑saving bulbs cannot be electrically dimmed, due to their low wattages, while tungsten and lower‑cost LED lights will change colour temperature as they are dimmed. In most cases, in fact, using a gel is actually preferable for controlling brightness, if a little less convenient! To dim all frequencies equally, use ND (or Neutral Density) gels. These gels appear grey, and are rated in 'stops' of light, or a simple number. The higher the number, the more light will be blocked and the dimmer your light source will become. 'Frost' gels can also be useful for diffusing light, making it less direct. I always have rolls of half CTB, half CTO, 0.6ND and some frost gels around. Bear in mind that some gels aren't designed for hot lights, and if you plan on leaving gels on tungsten lights for hours, you should probably invest in high‑temperature gels. 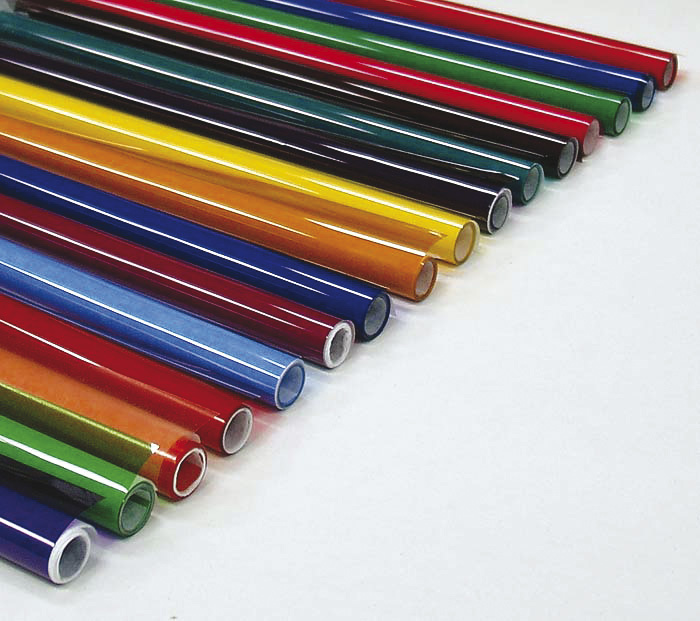 Solid gels are temperature resistant and very consistent in tone, but generally more expensive too. For the most part, small‑scale productions can make do with reflectors, rolls of gel, some foil and some black wrap, which is matte‑black aluminium foil.